One of the birding signs of summer for me is the arrival of Wood Storks on the upper Texas coast. They usually start showing up around mid-June and wander around the UTC until around mid-October. Their arrival in Texas is the result of what is known as post-breeding dispersal; nomadic movement driven by a search for food. The feeding technique of the Wood Stork is unique, involving the bird stooping over, with partially open beak in the water. Birds hunt standing still or moving very slowly with head swaying from side to side. Sometimes the stork will raise its wings or shake its foot on the bottom of a shallow body of water in hopes of stirring up food. Storks have heavy bills and move so slowly during the hunt that it is surprising to know that their favorite food is fish, a fast moving target. This is especially interesting because the Wood Stork doesn’t hunt by sight, but rather by touch. Foraging birds wait until a fish or some other organism hits the inside of their beak, at which time the beak rapidly snaps shut grasping the meal. 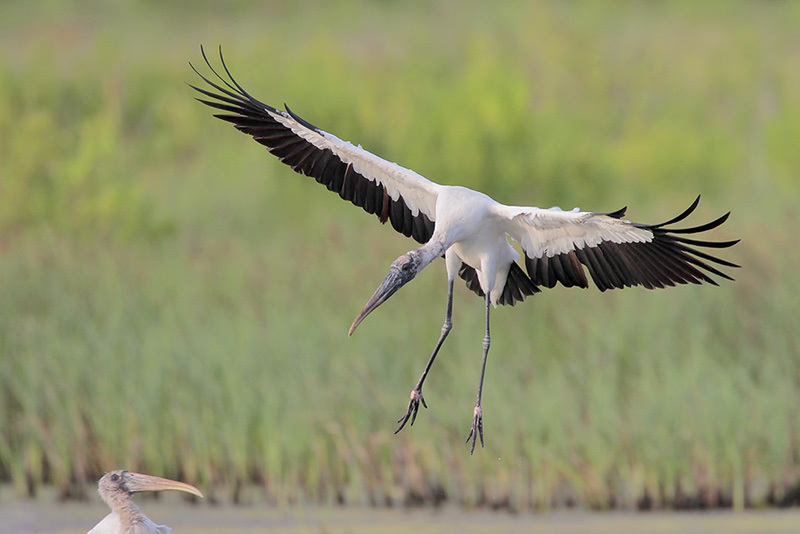 The closing of a Wood Stork’s beak is one of the fastest movements in the vertebrate world. 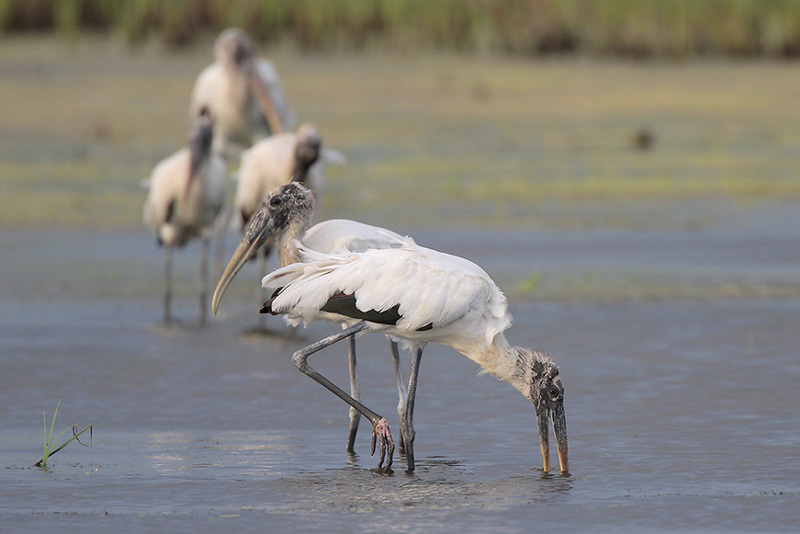 The diet of the Wood Stork isn’t limited to fish. These birds will eat just about anything they can snap their beak onto, including but not limited to, crabs, crawfish, snakes and other small animals. 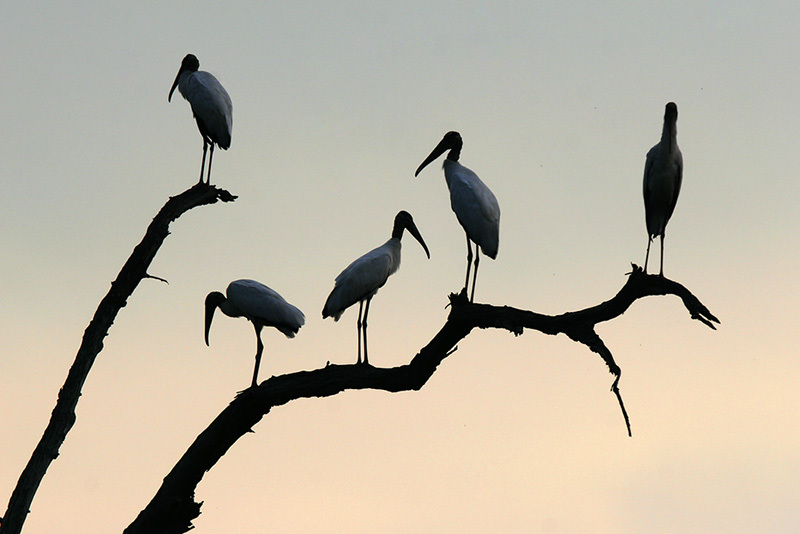 Wood Storks have even been reported to eat small alligators and even young rails and grackles. Wood Storks will also eat dead fish and even carrion, something they have in common with their closest relatives, the new world vultures. 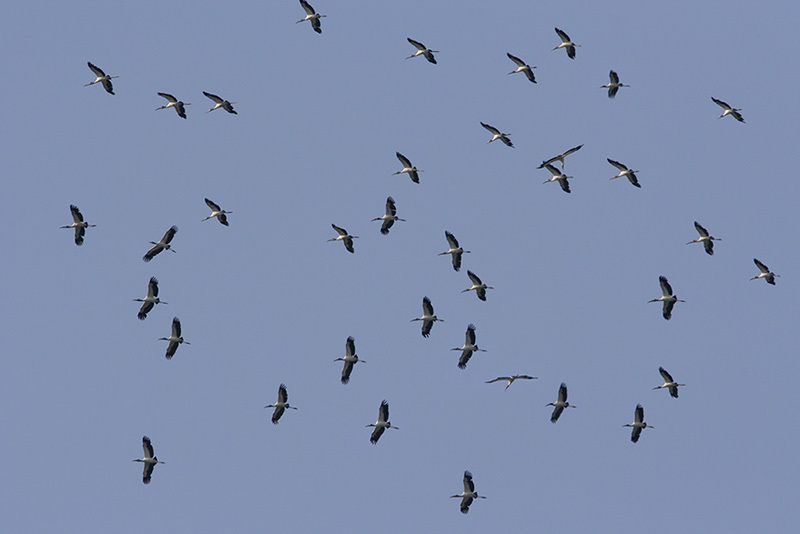 Sometimes storks hunt in groups, moving back and forth in a shallow body of water. 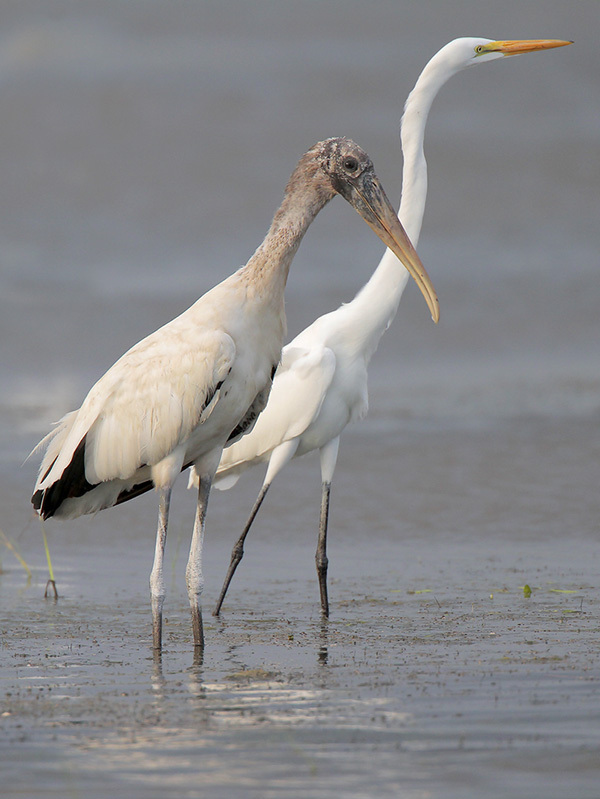 Since storks hunt by touch they can hunt is muddy water where other birds like egrets and herons are unable to. One of the drawbacks to the stork’s unique hunting method is that it depends on a chance collision of a prey item with the inside of the bird’s submerged beak. To increase the odds of encountering a prey item the birds are in constant search of drying up ponds where prey is concentrated and easy to catch. Another behavior that storks share with their relatives, the vultures, is the ability to soar high in the air. This allows them to survey large areas for potential feeding locations. 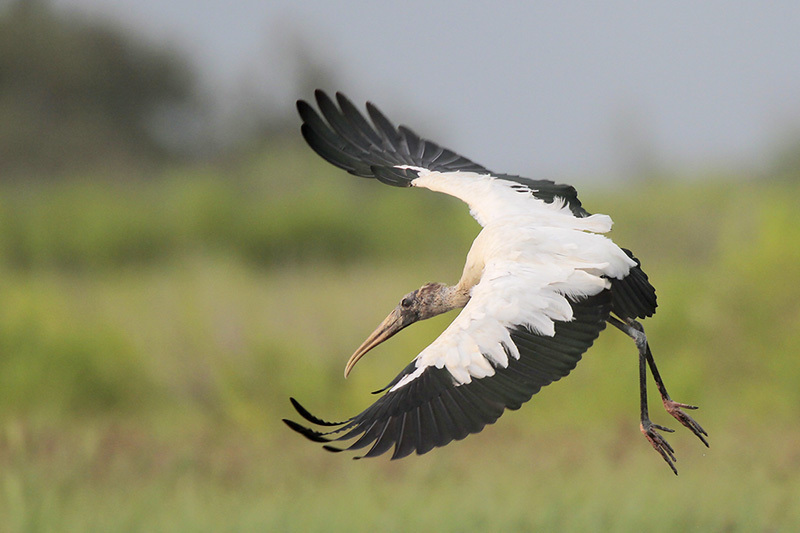 Wood Storks can be found riding thermals with vultures, flying with their necks and legs stretched out. This is a flying position that is not shared with herons and egrets, which normally fly with their necks coiled. Unique shape in flight and the black and white wings make Wood Storks easy to spot when flying at high altitudes.